No, we don’t know what that headline means either. But that’s the point. If you force copy into a stylistic straitjacket (ooh, there we go again), you get nonsensical non-sequiturs (hmmm). 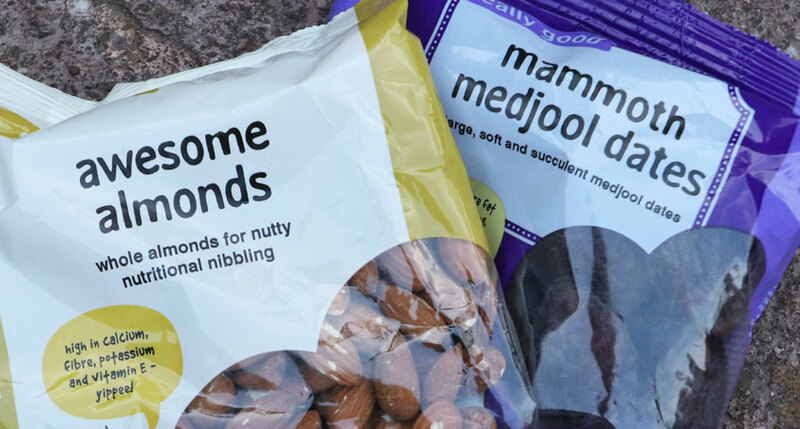 So when a few bags of fruit and nuts from Holland & Barrett turned up in our kitchen recently, we choked on our chorizo (okay, that’s gone far enough). What are these Perky Pecans and Happy Hazelnuts? More to the point, what makes Holland & Barrett’s pecans perky or their hazelnuts happy? Holland & Barrett has gone mad for alliteration. There are products on the website called Wowzers Walnuts, Moreish Mulberries, and Cherished Cranberries. But what do these names say about the product? Where’s the brand truth in a cherished cranberry? You can see there’s nothing to this empty-headed scheme when you spot that there are Absolutely Apricots and Authentic Apricots. How do their customers tell the difference between an absolute and an authentic apricot? And those Mammoth Medjool Dates? – fairly average size as far as we can tell. Copywriting schemes like this are invariably a creative straitjacket. What seemed like a clever idea at the start (Plump Prunes sounds reasonable) soon becomes a dead-end street. By the time you reach Beloved Brown Grain you know you’re finished. If you want to be creative, keep your copywriting open-ended. A rigid scheme limits your options: it compels you towards competitive compromise.